People out there are saying some pretty cool stuff about freelancers. Rumor has it that you work from the comfort of your home whenever you feel like it, all the while making great money. While there’s some truth to this, freelancing comes with considerable downsides that might even make you second-guess your career choice. 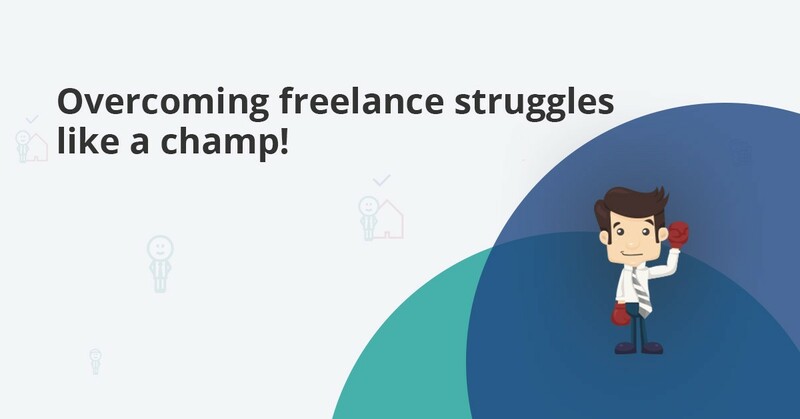 In this post, we are going to talk about 7 common freelance struggles that all freelancers experience at some point or another. We’ll also share tips that will help you get past them and remember why you chose (wisely) to become a freelancer in the first place. 1. Will I Get Paid? Fear of late payment or no payment at all is something that most freelancers face, especially new ones who haven’t built a stable clientele yet. Luckily, there is a lot you can do to protect yourself even when you work with a client for the first time. For starters, you can work on a platform like UpWork or PeoplePerHour. This guarantees that the client pays you unless you completely fail to deliver what they asked for. If you’re flying completely solo, make a freelance contract with your client. You can find contract templates online and use them as a guide to draft a contract with your terms and conditions, including payment details. As long as both parties agree to them, you’re good to go – and get paid! 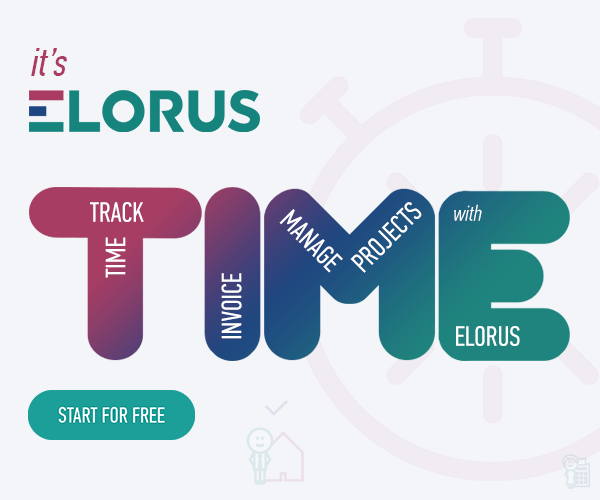 You can also use a time tracking tool like Elorus. Dull procedures like billing and invoicing will be taken care of, plus you will have tangible proof for every single minute worked. We’ll also make sure you get paid on time by sending automatic reminders to your clients! There are a lot of them, and they come in all varieties. Some have a sudden change of heart about the scope of the project two days before delivery; others keep emailing or calling you for no good reason. Then there are those who never seem completely happy with your work. And the list goes on. Depending on what you’re dealing with, there are several courses of action you can take. In most cases, a freelance contract can come to your rescue (again). Because it specifies the project details, it protects you from uncalled for revisions and changes and sets a limit to the client’s requirements. It doesn’t hurt to set a schedule either and let your clients know when they can contact you. Remember that not all clients are worth keeping. If they give you too much trouble and don’t respect your time or work, consider terminating your cooperation. Ah…working from home. Everything is still and quiet, no chatty colleagues around. What could possibly go wrong? Well, a lot! Social media, a partner with a conflicting schedule who wants their share of attention when they get home, your thoughts. Distractions and procrastination are a freelancer’s worst enemy, paving the way to an all-nighter to make it to the deadline. To that end, clearing your head before getting to work is essential. Morning exercise or meditation can help you with that. And if there is something you must do and will otherwise hover your mind, do that first. Setting a schedule also helps, especially if you are new to freelancing and still haven’t let go of your 9-5 mindset. You can gradually become more flexible with your work hours as you get accustomed to your new working reality. Moreover, as tempting as it is to work on the couch wearing your pajamas, it’s a bad idea. Work on your desk and, if possible, create an office setting. You don’t even have to work from home every day, all day. In fact, working from a cafe will save you from many house-related distractions. Then again, there are days when it’s impossible to concentrate. Thank your good luck for having the luxury to call the shots, turn off that laptop, and come back when your mind is all freshened and ready for work! In an equally realistic scenario, freelancers often get so caught up in work that they don’t realize it’s time to take a break or even have a meal. Bad news – overworking yourself can only lead to exhaustion and compromise the quality of your work. The secret to working the right amount of time is to work smart. Figure out when you are most productive and set your schedule accordingly. Take notes for a couple of weeks at the end of each hour, commenting on how energized or clearheaded you feel. You might realize you are no good around noon and set those hours aside for other activities. Certain time management techniques like the Pomodoro or the 168 hours technique might help you increase productivity and maintain smooth workflow throughout a project. So give them a try if prioritization and time management are not your strongest feature. You also need to take care of yourself. Make sure you get a good night sleep, eat balanced, and include physical activities in your daily schedule to relieve stress. That’s all good advice to stay productive each day without overdoing it. However, if you feel like you have been on your way to burnout for a long time now, consider taking a vacation to recharge your batteries. Ask any freelancer and they’ll tell you that variable income is one of the hardest things they had to deal with when they first started with freelancing. Luckily, there are a couple of things you can do to overcome this somewhat frustrating freelance struggle. First of all, keep track of your expenses at all times and for every little thing. It’s the only way you’ll always know where you stand and not overspend. Secondly, try to save a percentage of your income every month. We know it sounds like a joke when you can barely make ends meet, but try to keep some money on the side at least during your “good” months. You’ll need that money when work is slow or unexpected expenses come up. Another solution is to propose monthly contracts for regular clients. It’s a typical win-win situation: you get a stable income and they get to organize their finances better. Landing new clients is essential for expanding your connections and ultimately achieving financial stability. To that end, make it part of your daily routine to check job offers and approach prospects. Have a polished profile, and include testimonials from satisfied clients and work samples. The same goes for your LinkedIn profile or your website. A more unconventional way to approach potential clients is to answer questions on Quora. Offering solutions to problems they are facing will help you pitch more clients than you can imagine. Actually, stay active on the internet in general. Participate in industry-related forums, LinkedIn groups, find experts in your field and contact them for advice. Last but not least, never underestimate the power of good, old word-of-mouth advertising! Your friends and family can refer clients to you, and so will other satisfied clients. Solitude couldn’t be missing from our list of freelance struggles. It’s easy to spend days on end at home when you undertake time-sensitive projects and start to isolate yourself. Fortunately, it shouldn’t be so hard to fix this problem because it’s totally under your control. To begin with, find a quiet coffee place or library where you can work in peace, but still be around people. The presence of others might be distracting at first, but you’ll get used to it at no time. A pair of headphones is a good solution. Apart from that, make room in your schedule for your habits. It can be anything, from running with a friend to attending cooking classes. Whatever helps you let some steam off and interact with other people. Finally, pick up the phone and call someone. Make plans for the night. Keeping your friends and family around is essential for everyone, let alone you (pun intended) who spends a significant part of the day on your own. Being a freelancer is not a walk in the park, the same way no job is. Still, don’t let occasional difficulties bring you down because there is a simple solution to every freelance struggle. We hope that this post has given you actionable advice to overcome each and every one of them!